Experts are stumped on what to grow this spring as a third mainstay crop. 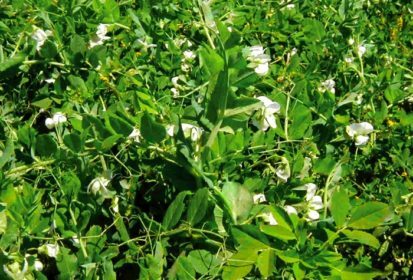 Peas have increasingly been the choice of many looking to avoid a canola-wheat rotation — but India’s trade barriers along with disease issues have left many of those producers scrambling to find an alternative. “I do believe pea acres will be down, but it’s too early to say how much,” said Chris Veenendaal, the Lethbridge-based regional manager for FarmLink Marketing Solutions. So the multimillion-dollar question is: What’s the alternative? Veenendaal thinks that chickpea acres might go up in southern Alberta, and some chickpeas could even replace peas. But that’s a scary thought because the small market for chickpeas could easily be swamped, he said. In fact, that’s a common theme — the markets for alternatives to peas and lentils (which are also down in price) are either well supplied or can’t absorb a big surge in production. “There’s nothing this year that will be a clear winner,” provincial crop specialist Harry Brook said as he went over the list of alternatives — all of which come with baggage. Malt barley, which often generates nice returns if you can produce high quality, saw good production this year and so premiums have shrunk, he said. Oats — either the horse industry or for human consumption — is another option but again, the market is well supplied. The early-maturing cereal was sown by many farmers stymied by wet conditions last spring and so production went up, said Brook, adding producers should keep watch as prices might improve over the winter. Hemp has some potential and while the stronger demand is on the organic side, that market is also well supplied. Flax and canary seed might be options for some but in addition to the risk of an easily oversupplied market, they come with other issues. Flax is susceptible to many of the same diseases that hit canola while Mexico is the prime but not terribly robust export market for canary seed. Moreover, growing something new is tricky. Hay could be a way to go — but that comes with a caveat, too. In southern Alberta, hay production can be as profitable, or even more profitable, than canola. But if you’re in an area with few cattle, trucking can take a big bite out of returns. Soybeans and corn have become big crops in Manitoba, but that province gets more hot weather than Alberta. Most corn grown in this province goes for silage and the jury is still out on new, even-shorter-season soybean varieties, although some farmers in the central part of the province are trying them. Along with the profitability question, producers also have to consider agronomic issues. “The unfortunate part of it is pulses are a broadleaf crop which is good in rotation, as opposed to canola every year except for the cereal,” said provincial market analyst Neil Blue. While it doesn’t qualify as a bright spot, feed barley might be worth considering for some, he said. Blue is hoping that low prices will be the cure for low prices, and that the drop in pea prices will spur exports to new markets. At this point green pea prices are currently better than yellow, but no one knows what this turbulent market will hold, he said. For now, it seems, farmers can only watch, wait, and hope.